An independent review of higher education & student finance in England. 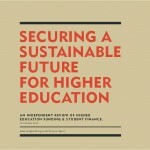 The Independent Review of Higher Education Funding and Student Finance was launched on the 9th November 2009. The review is tasked with making recommendations to Government on the future of fees policy and financial support for full and part-time undergraduate and postgraduate students. Lord Browne of Madingley has today published his Independent Review into Higher Education Funding and Student Finance. His recommendations present a radical plan to shake up higher education in England and a charter for choice for students, who will be entrusted with far more power to shape their own future. Under a new system, to be called the Student Finance Plan, no student will pay anything until they graduate and are in work. After leaving university, graduates will only begin repaying when they reach annual earnings of over £21,000 a year, up from £15,000 under the current system. Even then, the payments will be small, for example at an income level of £25,000 a year the repayments will be £7 a week. The current cap on fees of £3,290 per year will be removed, allowing universities to put quality first and charge accordingly. A tapered levy on institutions charging more than £6,000 per year will ensure that those which charge the most contribute more to supporting the poorest students. In addition, universities that wish to charge more will be required to demonstrate to the regulator and to their students both improved standards of teaching and fair admission. Demand for higher education will continue to increase and we will fund more places so that everyone who has the potential to benefit from HE gets the opportunity to do so. A 10% increase in student places will be factored into the system over the next four years. Careers advice is in need of a radical overhaul. Part of empowering our young people is ensuring they have the right information, advice and guidance to make the correct choice. This means careers advice in all schools of the kind currently being given in the private sector. Those who wish to pursue part-time study should have equal entitlement to tuition support under the Student Finance Plan. Part-time study provides a second chance for people who missed out earlier in their lives and it is important to level the playing field between part-time and full-time study. On the 8th July, Lord Browne and Diane Coyle visited City of Westminster College to meet students and staff involved with higher education delivered by a further education college. They met students from Access to HE, Foundation Degree, BSc and HNC courses, as well as staff members teaching those courses. Students discussed their individual experiences of higher education and what Government could do to facilitate better access to these courses. Lord Browne was also interested to hear how students’ employers were involved in their education. Lord Browne and Diane also visited the College’s new Paddington Green campus with the Principle Keith Cowell.